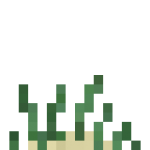 Marram Grass appears randomly in the world on top of sand in dune biomes. It has 3 possible sizes, which are purely decorative. It does not spread naturally. This page was last modified on 6 March 2019, at 14:32.